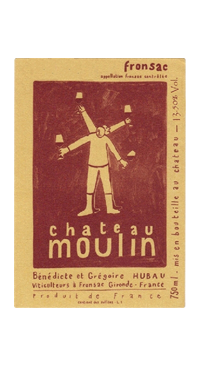 Bénédicte and Grégoire Hubau do not come from winemaking families, nor did they pursue studies in viticulture and enology. Yet, their love of wine eventually lured them from their home in northern France to Bordeaux where they finally left behind their careers in computers and chemistry to cultivate vines and make wine in the late 1980’s. Château Moulin Pey-Labrie, an estate in Fronsac met their requirements for having terroir de caractère. They learned on the job and through the years have tweaked their methods over the years in order to bring the reality of their work more perfectly in line with their vision. Refusing to slacken their strict quality standards, they frequently design their own equipment, including one machine that works the earth from below. In the cellar they consider themselves observers, letting the character of the land express itself freely and encouraging the greatest possible elegance and finesse in all of their wines. This is an organic Merlot from Canon-Fronsac. The grapes grow on limestone / clay soil and natural fermentation with indigenous yeasts takes place in temperature-controlled stainless steel or lined concrete tanks, and lasts three weeks. After fermentation the wine ages for 12 months in barrels of various ages. This is a bright and fresh style Bordeaux that can be enjoyed early in it’s life.